Some developers just create a default instance and continue on their work. Others would just change the configuration file or have a local copy of the configuration file to match their environment and move on. There is another approach that we can use which would use less resources (in the case of another instance), and it is a lot more convenient than having to manage multiple configuration files. 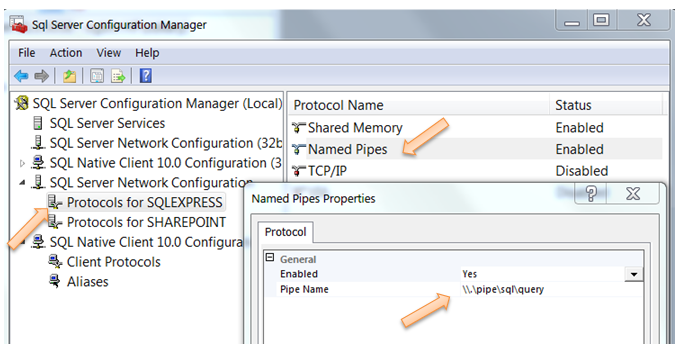 We can use named pipes configuration to change the pipe name from the instance name to the default instance. After making those changes, we can try to connect to our database using SQL Server Management Studio. We can try to connect to the database with both (local) and (local)\express for server name, and both connections should be successful.